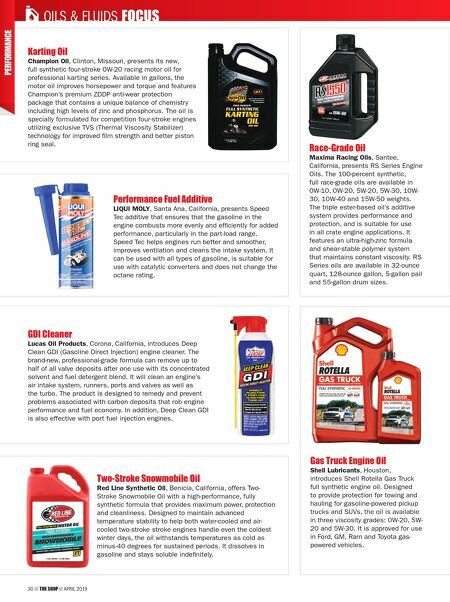 30 THE SHOP APRIL 2019 GDI Cleaner Lucas Oil Products, Corona, California, introduces Deep Clean GDI (Gasoline Direct Injection) engine cleaner. The brand-new, professional-grade formula can remove up to half of all valve deposits after one use with its concentrated solvent and fuel detergent blend. It will clean an engine's air intake system, runners, ports and valves as well as the turbo. The product is designed to remedy and prevent problems associated with carbon deposits that rob engine performance and fuel economy. In addition, Deep Clean GDI is also effective with port fuel injection engines. Gas Truck Engine Oil Shell Lubricants, Houston, introduces Shell Rotella Gas Truck full synthetic engine oil. Designed to provide protection for towing and hauling for gasoline-powered pickup trucks and SUVs, the oil is available in three viscosity grades: 0W-20, 5W- 20 and 5W-30. It is approved for use in Ford, GM, Ram and Toyota gas- powered vehicles. 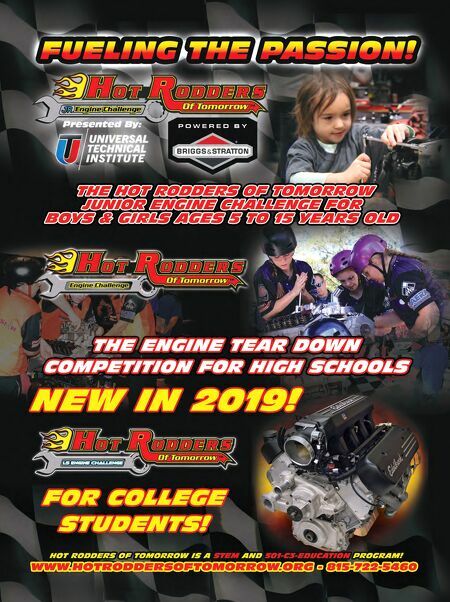 Race-Grade Oil Maxima Racing Oils, Santee, California, presents RS Series Engine Oils. The 100-percent synthetic, full race-grade oils are available in 0W-10, 0W-20, 5W-20, 5W-30, 10W- 30, 10W-40 and 15W-50 weights. The triple ester-based oil's additive system provides performance and protection, and is suitable for use in all crate engine applications. It features an ultra-high-zinc formula and shear-stable polymer system that maintains constant viscosity. RS Series oils are available in 32-ounce quart, 128-ounce gallon, 5-gallon pail and 55-gallon drum sizes. Two-Stroke Snowmobile Oil Red Line Synthetic Oil, Benicia, California, offers Two- Stroke Snowmobile Oil with a high-performance, fully synthetic formula that provides maximum power, protection and cleanliness. Designed to maintain advanced temperature stability to help both water-cooled and air- cooled two-stroke stroke engines handle even the coldest winter days, the oil withstands temperatures as cold as minus-40 degrees for sustained periods. It dissolves in gasoline and stays soluble indefinitely. Performance Fuel Additive LIQUI MOLY, Santa Ana, California, presents Speed Tec additive that ensures that the gasoline in the engine combusts more evenly and efficiently for added performance, particularly in the part-load range. Speed Tec helps engines run better and smoother, improves ventilation and cleans the intake system. It can be used with all types of gasoline, is suitable for use with catalytic converters and does not change the octane rating. OILS & FLUIDS FOCUS Karting Oil Champion Oil, Clinton, Missouri, presents its new, full synthetic four-stroke 0W-20 racing motor oil for professional karting series. Available in gallons, the motor oil improves horsepower and torque and features Champion's premium ZDDP anti-wear protection package that contains a unique balance of chemistry including high levels of zinc and phosphorus. The oil is specially formulated for competition four-stroke engines utilizing exclusive TVS (Thermal Viscosity Stabilizer) technology for improved film strength and better piston ring seal.